Ellen White (1827-1915): “nor was it hallowed by those visible tokens of the divine presence which pertained to the first temple… The Shekinah no longer abode between the cherubim in the most holy place; the ark, the mercy seat” (GC, p. 24). Ellen White: “It was shadowed by the wings of the golden cherubim, and the unspeakable glory of the Shekinah, the visible symbol of the most high God, had rested over it in the holy of holies” (PP, p. 584). Ingraham J. H (1809-1860): “…of the visible presence of Jehovah, in the Shechinah once present there” (The prince of the house of David, p. 16, 1855). Ingraham J. H (1809-1860): “Beyond was the holy ark of the covenant, over which the cherubim hovered… As this was the holy of holies, I was not permitted to see it; … the seat of god’s throne on earth, alas, now left vacant since the glory of the Shechinah departed from the Holy of Holies!” (The Prince of the house of David, p. 238, 1855). Ellen White (1827-1915): “Christ has made baptism the sign of entrance to His spiritual kingdom. He has made this a positive condition with which all must comply who wish to be acknowledged as under the authority of the Father, the Son, and the Holy Spirit. Before man can find a home in the church, before passing the threshold of God’s spiritual kingdom” (Evangelism, p. 307, 1946). Thomas Stephen: “…that spiritual kingdom, the universal church which Christ was about to erect, the entrance into which was to be by the gate of baptism, which is the womb of the church” (A Gospel History of our Lord and saviour Jesus Christ: or, a Life of the Man of Sorrows, p. 112, 1853). Ellen White (1827-1915): “But the second temple had not equaled the first in magnificence; nor was it hallowed by those visible tokens of the divine presence which pertained to the first temple. There was no manifestation of supernatural power to mark its dedication. No cloud of glory was seen to fill the newly erected sanctuary. No fire from Heaven descended to consume the sacrifice upon its altar. The shekinah no longer abode between the cherubim in the most holy place; the ark, the mercy-seat, and the tables of the testimony were not to be found therein… The second temple was not honored with the cloud of Jehovah’s glory, but with the living presence of One in whom dwelt the fullness of the Godhead bodily,—who was God himself manifest in the flesh… In the presence of Christ, and in this only, did the second temple exceed the first in glory” (4SP, pp. 24, 25, 1884; GC, p. 24, 1911). John Williamson Nevin (1803-1886): “No cloud of glorious majesty was seen taking possession of its newly erected sanctuary: no fire descended from heaven to kindle the sacrifice upon its altar: no Sechinah abode between the cherubim in the Most Holy Place. Alas, there was neither ark, mercy- seat, or cherubim, found there! They had perished, with the two tables of the law, in the ruin of the other temple… The second temple never equaled the first in the costly magnificence of its work, and wanted much that gave moral dignity and sacredness to the other: but it obtained pre – eminence, at last, by such a manifestation of Divine presence within its courts as the first was never permitted to enjoy. It was not honoured with the Cloud of Jehovah’s glory, but it was distinguished by the presence of Jesus Christ, in whom dwelt all the fullness of the Godhead bodily – who was God manifest in the flesh! (A Summary of Biblical Antiquities: Compiled for the use of Sunday School Teachers, Vol. 2, pp. 76, 77, 1830). Ellen White (1827-1915): “The Saviour remembered that after His long fast in the wilderness of temptation, He had fainted, and that angels had ministered to Him. Without hesitation He wrought a miracle to feed the thousands who had followed Him” (Signs of the Times, September 23, 1908). Ingraham J. H (1809-1860): “And this mighty Prophet, who could thus feed an army, voluntarily suffered forty days and nights the pangs of hunger in the desert! He seems both a man in suffering, and a God in creating!” (The Prince of the House of David, p. 167, 1855). Ellen white (1827-1915): “He was unwilling to strictly follow the plan of obedience and procured a lamb and offer it with the first fruit of the ground. He merely took of the ground and discarded the requirement of God. God had made known to Adam that without shedding of blood there could be no remission of sin” (Story of Redemption, p. 52, 1947). Ellen White: “Abel brought of the firstlings of his flock and of the fat, as God had commanded and in full faith of the Messiah to come” (Story of redemption, p. 53, 1947). Ellen White: “Abel meekly points out his brother’s error and shows him that the wrong was in himself…While Abel justifies the plan of God, Cain becomes enraged, and his anger increases and burns against Abel until in his rage he slays him” (Story of Redemption, pp. 53-54, 1947). Ellen White: “The angel inquires of him the reason of his anger… the angel tells Cain that it was no injustice on the part of God, or partiality shown to Abel” (Story of redemption, p. 53, 1947). Ellen White: “Cain was not particular to bring even the best of fruits” (Story of Redemption, p. 52, 1947). Adam Clarke (1760-1832): Cain brought of the ground an offering unto the Lord…by which he testified his belief in him as the Lord of the universe, and dispenser of secular blessings. Abel brought… a gratitude offering; and besides this he brought of the first born of his flock, and it was by this alone that he acknowledged himself a sinner, and professed faith in the promised Messiah. Cain said unto Hebel his brother,… “and now there is respect of persons in judgment.” And Hebel answered and said, “…there is no respect of persons in judgment, but because my works were better and more precious than thine…” (Adam Clarke Commentary, 1831). Matthew Henry (1662-1714): “In the qualities of the offering Cain brought of the fruit of the ground, anything that came next to hand, what had not occasion for himself or what was not marketable” (Matthew’s Complete Commentary on the Bible, 1706). John Milton (1608-1674): A sweaty reaper from his tillage brought first fruits, the green ear, and yellow sheaf, unculled, as came to hand (Paradise Lost, book xi. 423-456). Ellen White (1827-1915): “It is the idle mind that is Satan’s workshop” (Ed, p. 190, 1903). Benjamin Rush (1746-1813): “An idle man’s brain, (says the celebrated and original Mr. Bunyan) is the Devil’s workshop” (Essays, Literary, Moral and Philosophical, p. 267, 1798). The Plaindealer (Published by Wm. Van Norden): “An idle man’s brain,” says John Bunyan, “is the devil’s workshop”” (The Plain Dealer, Vol. 1, p. 613, 1836). Ellen White: “One soul saved from error, and brought under the banner of Christ will cause joy in heaven and place a star in your crown of rejoicing” (MYP, p. 23, 1930). Ellen White: “By living a life of devotion and self-sacrifice in doing good to others, you might have been adding stars and gems to the crown that you will wear in heaven, and laying up unfading treasure” (MS 69, 1912). Samuel S. Snow (1806-1870): “I feel that when the blessed time shall come, I shall have a few souls to present, at least, at stars in my crown of rejoicing” (The Advent Herald, And Signs of the Times Reporter, [Himes], Vol. 7, Feb 28, 1844. Published by Joshua V. Himes). Eliza E. Hewitt (1851-1920): “Will there be any stars in my crown?” (SDA Church Hymnal, 1981). Ellen White (1827-1915): “… for the very first lesson to be learned is the lesson of self-denial” (RH, December 6, 1881). Ellen White (1827-1915): “These young persons, although they profess to be Christians, have never taken the cross of Christ; for the very first lesson to be learned of Christ is the lesson of self-denial” (Counsels on Stewardship, pp. 251, 252, 1940; ST, March 31, 1887). Jeremiah Burroughs (1599-1646): “Self-denial is a hard lesson. Bradford, the martyr, said, whoever has not learned the lesson of the cross has not learned his A – B – C in Christianity.” This is the first lesson that Christ teaches any soul”” (The Rare Jewel of Christian Contentment, p. 10, 1651). Matthew Henry (1662-1714): “It is the fundamental law of admission into Christ’s school, and the first and great lesson to be learned in this school, to deny ourselves” (Matthew Henry’s Complete Commentary on the Bible, Matt 16: 24, 1710). Matthew Henry (1662-1714): “The first lesson in Christ’s school is self-denial” (Dictionary of Burning Words of Brilliant Writers, p. 335, 1895). Ellen White (1827-1915): “…the impulsive, self-sufficient, warmhearted Peter” (Ed, pp. 85, 86, 1903). Ellen White: “Peter speaking for his brethren, had then declared his loyalty to Christ” (DA, p. 673). Cunningham Geikie (1824-1906): “Peter was fiery energetic… warm-hearted and impulsive… He is always the first to speak for his brethren” (Life and Words of Christ, p. 47, 1879). Ellen White: “The Saviour’s affection for the beloved disciple was returned with all the strength of ardent devotion. John clung to Christ as the vine clings to the stately pillar…The confiding love and unselfish devotion manifested in the life and character of John” (The Sanctified Life, pp. 53, 54, 1889). Ellen White: “He pressed close to Jesus, sat by His side, leaned upon His breast. As a flower drinks the sun and dew, so did he drink in the divine light and life. In adoration and love he beheld the Saviour…” (Ed, p. 87, 1903). Cunningham Geikie (1824-1906): “He of all the twelve, drank deepest into his Master’s spirit… self-contained, mediative, tender…His whole spiritual nature gave itself up to loving contemplation of the wondrous life passing before him… If perfect love beget love in return, it was inevitable that John should win the supreme place in Christ’s affections” (Life and Words of Christ, pp. 48, 49, 1879). Ellen White (1827-1915): “He allowed the evil spirits to destroy the heard of swine as a rebuke to those Jews, who, by raising these unclean beasts for the sake of gain, had transgressed the command of God” (4SP, p. 333, 1884). J. Sadler: “The gadarenes, being a mixture of Jews and heathens, fed great number of swine; or living on the borders of the heathen, the Jews fed the swine to sell them” (Sacred Records of The History of Our Lord and Saviour Jesus Christ, p. 142, 1835). Johann Albrecht Bengel (1687-1752): “The owners of the swine were either heathens dwelling among the Jews, or Jews greedy of gain” (Bengel’s Gnomon of the New Testament, 1742). Joseph Benson (1748-1821): “Which it was not lawful for the Jews to keep much less to eat: yet great numbers of them were bred up in that extreme part of the country, out of regard to the gain of such merchandise, for they sold them to the Roman soldiers, and other Gentiles, who were very numerous in these parts” (Benson’s Commentary of the Old and New Testaments, 1818). J. W. Farrar (1831-1903): “Their precious swine were evidently in danger; the greed, gluttony of every apostate Jew and low-bred Gentile in the place were clearly imperiled by such a one as they saw that Jesus was” (Life of Christ, Vol. 1, p. 341, 1874). Ellen White (1827-1915): “At midnight Samson was aroused. The accusing voice of conscience filled him with remorse, as he remembered that he had broken his vow as a Nazarite” (PP, p. 365). John Gill (1697-1771): “And Samson lay till midnight, and arose at midnight,…Either not being able to lie any longer through the conviction of his conscience for his lewdness, or being warned by a dream, or having an impulse upon his spirit, which suggested to him that wait was laid for him, and the danger he was in” (Gill’s Exposition of the Whole Bible, 1748). Matthew Poole (1624-1679): “Arose at midnight; being either smitten in conscience for his sin, when he first awaked, and thence fearing danger, as he had just cause to do; or being secretly warned by God in a dream, or by an inward impulse, for the prevention of his designed destruction” (English Annotations on the Holy Bible, 1683). Matthew Henry (1662-1714): “He rose at midnight, perhaps roused by a dream, in slumberings upon the bed (Job 33:15), by his guardian angel, or rather by the checks of his own conscience. He arose with a penitent abhorrence (we hope) of the sin he was now committing, and of himself because of it” (Complete Commentary on the Bible, 1706). Ellen White (1827-1915): “Adam had learned from the Creator the history of creation; he himself witnessed the events of nine centuries; and he imparted his knowledge to his descendants. The antediluvians were without books, they had no written records; but with their great physical and mental vigor, they had strong memories, able to grasp and to retain that which was communicated to them, and in turn to transmit it unimpaired to their posterity” (PP, p. 83, 1890). J. W. Nevin (1803-1886): “There was no written Bible, to make known the will of the Most high. But what God revealed to Adam and others after him, was carefully remembered, and handed down by the word of mouth. When men lived so long, it was easy to preserve knowledge in this way” (A Summary of Biblical Antiquities: Compiled for the use of Sunday school Teachers, Vol. 2, p. 13, 1830). Ellen White (1827-1915): “The work of the investigative judgment and the blotting out of sins is to be accomplished before the second advent of the Lord. Since the dead are to be judged out of the things written in the books, it is impossible that the sins of men should be blotted out until after the judgment at which their cases are to be investigated. But the apostle Peter distinctly states that the sins of believers will be blotted out “when the times of refreshing shall come from the presence of the Lord; and He shall send Jesus Christ.” Acts 3:19, 20.”” (GC, p. 485, 1911). Ellen White: “Now is the time when we are to confess and forsake our sins, that they may go beforehand to judgment and be blotted out” (RH, November 19, 1908). William Burkitt (1650-1703): “But the days of refreshment are thought by most to signify the day of judgment, which will be a day of refreshing of all penitent sinners; because they shall then enjoy a complete and full absolution from all their sins. That almighty God has his book of remembrance, in which he writes down all the sins which every person commits, in order to their accusation and charge. That it is the great wisdom, interest and duty of every person, to take care that he gets his sins now blotted out of God’s debt book, as ever he hopes that the reckoning day may be a day of refreshing to him. That without repentance, conversion, and turning unto God, there will be no forgiveness, comfort, or refreshment from him. Repent, that your sins may be blotted out, when the times of refreshment shall come. That a complete absolution and full discharge from all sin is not yet enjoyed, till the day of judgment. We are in this life continually subject to new sins; and consequently are daily contracting new guilt, whereby arise new fears; so that a soul has not a full rest till the final absolution be pronounced at that solemn day” (Expository Notes with Practical Observations on the New Testament: Acts 3, 1700). Ellen White (1827-1915): “In a time of almost universal apostasy his father’s household were among the number who had not bowed the knee to Baal. Theirs was a home where God was honored and where faithfulness to duty was the rule of daily life” (Ed, p. 58, 1903; PK, p. 217, 1917). 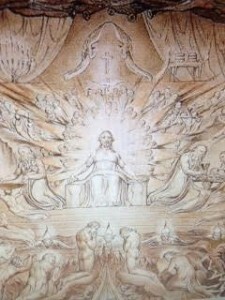 Friedrich Wilhelm Krummacher (1796-1868): “How often, perhaps, was the name of Elijah mentioned, [by Elisha and his servants] and the fiery sign on Carmel made the subject of discussion. For they had probably been eye-witnesses of that miracle; and might belong to that seven thousand who had not bowed the knee to Baal…Elisha was the first child of God, whom, after a long period of solitude, he had the happiness to meet; he found in the person of the son of Shaphat, the first and the chief of the seven thousand, and the first seal of the promise granted him at Horeb on behalf of his people” (Elijah The Tishbite, p. 249, 1836). Jamieson (1802-1880): “Elisha the son of Shaphat — Most probably he belonged to a family distinguished for piety, and for their opposition to the prevailing calf-worship” (Commentary Critical and Explanatory on the Whole Bible: 1Kings 19:19, 1871). Ellen White (1827-1915): “And, overwhelmed and pained with His majesty and exceeding glory, they with one accord raise their voices, and with terrible distinctness exclaim, “Blessed is He that cometh in the name of the Lord!” (EW, p. 292, 1882). Ellen White: “With one voice the wicked hosts exclaim: “Blessed is He that cometh in the name of the Lord!” It is not love to Jesus that inspires this utterance. The force of truth urges the words from unwilling lips” (GC, p. 662, 1911). John Gill (1679-1771): “since, though they would be obliged to confess that he was Lord and Christ, they would never say the above words to him in faith, and holy reverence of him” (John Gill’s Exposition of the Whole Bible, Matthew 23, 1748). Heinrich Meyer (1800-1873): “…at His second appearing, which will follow immediately upon the ruin of the city (Matthew 24:29), His obstinate enemies will be constrained to join in the loyal greeting with which the Messiah will be welcomed (Matthew 21:9), for the manifestation of His glory will sweep away all doubt and opposition, and force them at last to acknowledge and confess Him to be their Deliverer” (Heinrich Meyer’s Critical and Exegetical Commentary on the New Testament, Matthew 23, 1882). Ellen White (1827-1915): “The accumulated sins of every individual will be written with absolute accuracy, and the penetrating light of God’s law will try every secret of darkness… In that solemn and awful hour the unfaithfulness of the husband will be opened to the wife, and the unfaithfulness of the wife, to the husband. Parents will then learn, for the first time, what was the real character of their children, and children will see the errors and mistakes that marked the lives of their parents… God has an exact record in his books” (RH, March 27, 1888). Joseph Sutcliffe (1762-1856): “The dead, small and great, the prince and the peasant, shall stand in order at the great tribunal. The husband and the wife, the master and the servant, the child and the parent shall be there, and tried in the presence of one another. Yea, and the books of conscience shall be opened, and nothing forgotten, nothing covered, nothing disguised. Oh what a day of naked simplicity, and what a day of disclosure of secret things! Oh what a day for the study of providence, and for tracing the wisdom and righteousness of God! In those books our sins will be fairly recorded, and we shall be found guilty. We shall be weighed and found wanting. Happy that another book is opened, which is the book of life. Happy to have our name erased from the records of death, and enrolled by regeneration among the living!” (Sutcliffe’s Commentary on the Old and New Testaments, 1835). Ellen White (1827-1915): “The final judgment is a most solemn event, which must take place before the assembled universe. When God honors His commandment-keeping people, not one of the enemies of truth and righteousness will be absent. And when transgressors receive their condemnation, all the righteous will see the result of sin. God will be honored, and His government vindicated; and that in the presence of the inhabitants of the universe.” (Review and Herald, June 18, 1901). Ellen White: “Each one in the day of investigative Judgment will stand in character as he really is; he will render an individual account to God… The mind will recall all the thoughts and acts of the past; the whole life will come in review like the scenes in a panorama. Thus every one will be condemned or acquitted out of his own mouth, and the righteousness of God will be vindicated” (RH, Nov 4, 1884). Jamieson (1802-1880): “We are at all times, even now, manifest to God; then we shall be so to the assembled intelligent universe and to ourselves: for the judgment shall be not only in order to assign the everlasting portion to each, but to vindicate God‘s righteousness, so that it shall be manifest to all His creatures, and even to the conscience of the sinner himself” – Commentary Critical and Explanatory on the Whole Bible, 2 Corinthians 5:10, 1871). Ellen White (1827-1915): “He is our pattern. Have you, Brother A, imitated the Pattern? I answer: No. He is a perfect and holy example, given for us to imitate. We cannot equal the pattern; but we shall not be approved of God if we do not copy it and, according to the ability which God has given, resemble it” (2T, p. 549, 1871). Ellen White: “You cannot equal the Pattern [Christ], but you can resemble it” (2MR, p. 126). John Calvin (1509-1564): “You shall therefore be perfect. This perfection does not mean equality, but relates solely to resemblance. However distant we are from the perfection of God, we are said to be perfect, as he is perfect, when we aim at the same object, which he presents to us in Himself. Should it be thought preferable, we may state it thus. There is no comparison here made between God and us” (Calvin’s Commentary on the Bible, Matthew 5: 48). Ellen White (1827-1915): “The sin of unbelief, by which their confidence in the Son of God was destroyed, led Israel far astray. At the very time when they should have been praising God and magnifying the name of the Lord, talking of his goodness, telling of his power, they were found in unbelief, and full of murmuring and complaint. The deceiver was seeking through every means possible to sow discord among them, to create envy and hatred in their hearts against Moses, and to stir up rebellion against God, and by listening to the voice of the great deceiver they were led into affliction, trial, and destruction” (ST, April 25, 1895). J. C. Ryle (1816-1900): “Unbelief made Eve eat the forbidden fruit, – she doubted the truth of God’s word: “Ye shall surely die.” Unbelief made the old world reject Noah’s warning, and so perish in sin. Unbelief kept Israel in the wilderness, – it was the bar that kept them from entering the promised land. Unbelief made the Jews crucify the Lord of glow [glory], – they believed not the voice of Moses and the prophets, though read to them every day. And unbelief is the reigning sin of man’s heart down to this very hour, – unbelief in God’s promises, – unbelief in God’s threatenings, – unbelief in our own sinfulness, – unbelief in our own danger, – unbelief in everything that runs counter to the pride and worldliness of our evil hearts” (The upper Room: The Duties of parents, Chapter XVI, 1887). Ellen White (1827-1915): “The strongest argument in favor of the gospel is a loving and lovable Christian” (Ministry of Healing, p. 470, 1905; See also DA, p. 142). Ellen White: “The life of a true, lovable Christian is the most powerful argument that can be produced in favor of the Gospel” (ST, August 16, 1905). Theodore L. Cuyler (1822-1909): “The worst men may scoff at Bible -religion, but at heart honor the consistent Christian who wears the beauty of holiness in his character and conduct. A living, lovable Christian is the most powerful argument for the Gospel” (Heart Life, p. 69, 1871). 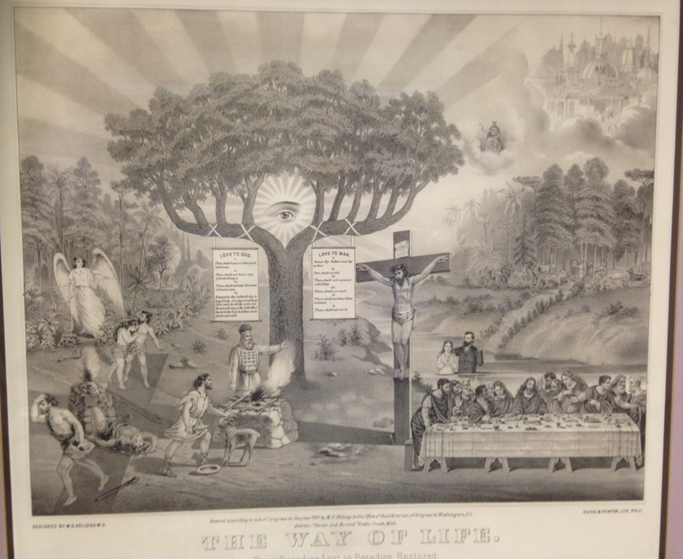 Ellen White (1827-1915): “Above the throne is revealed the cross; and like a panoramic view appear the scenes of Adam’s temptation and fall, and the successive steps in the great plan of redemption” (4SP, p. 481, 1884). Rev. George Horne (1730-1792): “When the Son of man shall display his banner, the cross in the clouds” (The Discourses of The Right Reverend George Horne, p. 114, 1824). Note: The concepts expressed in Ellen White’s statement can be identified in the illustrations below. Ellen White (1827-1915): “This is not the judgment of a few individuals, or even of a nation, but of a whole world of human intelligences, of accountable beings. It is to be held in the presence of other worlds” (RH, November 22, 1898). Edward Griffin (1770-1837): “…and the three worlds shall be assembled at his bar… he appears the sovereign judge… to judge the world, to call to a strict account, to scrutinize every action and thought from Adam to his youngest son… Then when all your sins shall be displayed before the assembled worlds…” (Sermons By The Late Rev. Edward Griffin, Vol. 2, p. 61, 1838). Ellen White (1827-1915): “There are men today who express their belief that there will be marriages and births in the new earth; but those who believe the Scriptures cannot accept such doctrines. The doctrine that children will be born in the new earth is not a part of the “sure word of prophecy” (2 Peter 1:19). The words of Christ are too plain to be misunderstood… They should forever settle the question of marriages and births in the new earth. Neither those who shall be raised from the dead, nor those who shall be translated without seeing death, will marry or be given in marriage. They will be as the angels of God, members of the royal family. I would say to those who hold views contrary to this plain declaration of Christ, Upon such matters silence is eloquence. It is presumption to indulge in suppositions and theories regarding matters that God has not made known to us in His Word. We need not enter into speculation regarding our future state” (1SM, pp172, 173, 1958; MM, pp. 99, 100). SDA Bible Commentary, Vol. 5: “But, to Jesus, their big problem was that they did not know the power of God or His Word. They “forgot that a God powerful enough to raise men from the dead also had the wisdom and power to set up anew a perfect order of society in the perfect new earth. Furthermore, all who are saved will be contented and happy with the glorious new order of things, even though they cannot fully realize in this life what the future will bring forth. … Evidently there will be no need for marriage, because a different order of life will prevail”” (The SDA Bible Commentary, vol. 5, p. 483, Taken from Sabbath School Lesson 13, Sep 22, 1999, God’s re-Creation: The Earth Made new). Note: I had searched to verify the above citation but in vain. The Bible commentary Volume 5 begins with Matthew, with page number 1775, besides, there is no comment on the verse 30 of Matthew Ch. 22. Angel Manuel Rodriguez (Retired BRI Director): “At the resurrection people will not get married, because in the absence of death there is no need to perpetuate the human race through reproduction. In that sense humans will be like the angels, who don’t have to marry because they don’t die… Jesus’ answer creates in the mind of some a theological dilemma: If marriage, like the Sabbath, was instituted before the entrance of sin, why would it be incompatible with life in the new age? Would not this suggest that sin was able to damage a divine institution beyond repair, and that evil somehow thwarted divine intention for humanity?…In order to deal with the theological issue raised here I have to assume that God did not originally intend marriage to be a permanent or eternal social institution. This idea seems to be hinted at in Genesis. Marriage had two clear and closely related functions: procreation and companionship. Procreation had a very specific goal—“Be fruitful and multiply; fill the earth” (Gen. 1:28)—implying that in the absence of death once that goal was achieved procreation would come to an end. This was confirmed by Jesus in His answer to the Sadducees” (Marriage in Heaven, August, 2012). Spence-Jones, HDM (1836-1917): “On earth men are mortal, and marriage is necessary to perpetuate the race; no such necessity obtains in the other life, where men are immortal. As an old Father says, “Where the law of death is abolished, the cause of birth is abolished likewise.” Are as the angels of God in heaven… They are immortal, no longer subject to human wants, passions, failings, or temptations; they serve God perfectly without weariness or distraction; they have no conflict between flesh and spirit, between the old nature and the new; their life is peaceful, harmonious, satisfying” (The Pulpit Commentary, Matthew 22;30, 1890). Ellen White (1827-1915): “I recommend to you, dear reader, the Word of God as the rule of your faith and practice” (3SM, p. 29). William Tiptaft (1803-1864): “My advice to you is to keep close to the Bible. Let no one set up a standard for you… You had much better read the Bible than any other book; you can expect God’s blessing in reading it when it cannot be expected with any other… But I recommend you to read your Bible alone” (letters of William Tiptaft, 1830).